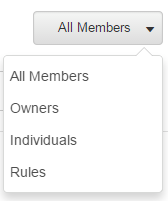 Click the Directory menu to quickly search for people, members of groups, and external contacts. To find the people you need, type keywords in the search field. 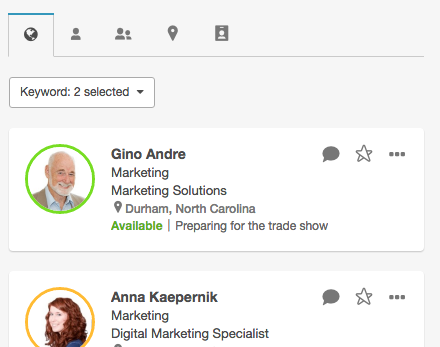 Keywords can be names, titles, departments, skills, or anything else in profile pages. Restrict your search to specific profile fields for a more exact match. Type one or more keywords in the search field. 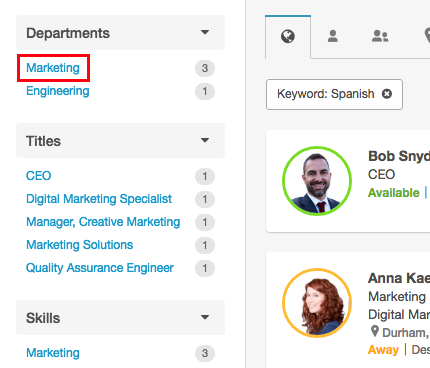 For example, type “marketing Spanish” to find people who are in the marketing department and speak Spanish. Select a result from the list or press Enter for full results. The full results list includes all results that contain all of the keywords you entered. 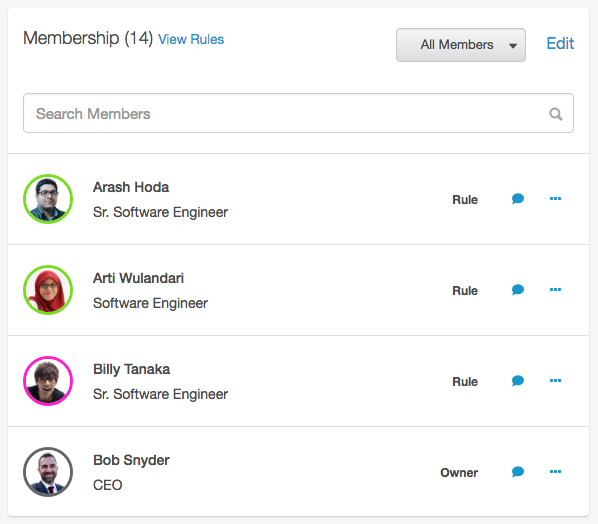 Sort the results by people, groups, locations, and contacts. 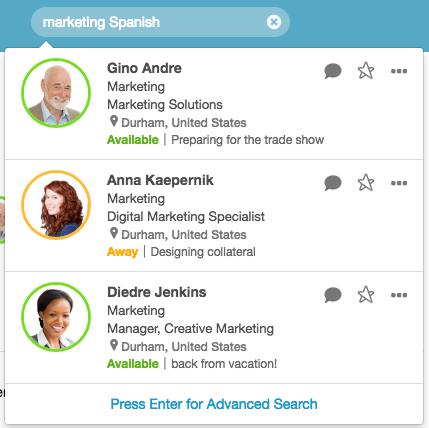 Learn more about searching for groups or searching for external contacts. 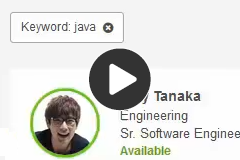 In the search field, type keywords that describe the group. Select the group from the results list or from the Search page. 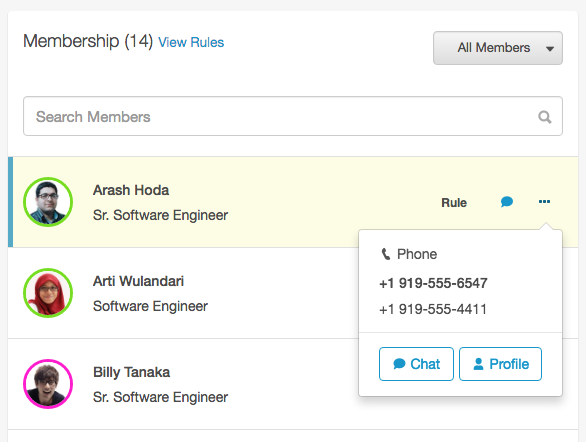 Contact members individually by phone or chat. 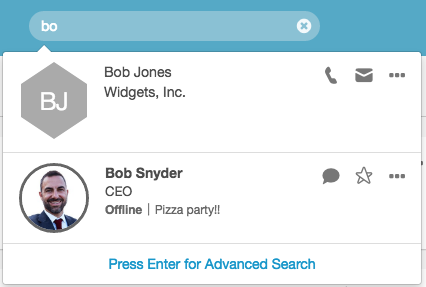 Use search to find external contacts. Administrators add external contacts for your organization, but these contacts are not organization members and cannot log on. External contacts have hexagonal profile icons. In the search field, type keywords that describe the external contact. PureCloud displays a list of the top results. Note: You can also enter the Directory without starting a search. Click the Directory menu. Click Contacts to filter for external contacts.